The independent Island nation of the Bahamas with more than 700 islands is located just a few miles off the coast of Florida in the middle of the mysterious Bermuda triangle. The Bahamas are known for its small tropical islands, white sandy beaches and warm, turquoise waters. Visit famous Pig Beach and swim with the friendly pigs during the optional tour (surcharge applies). The top rates beaches of the world are located in this beautiful archipelago. . The ferry is equipped with comfortable seats, restrooms and a snack bar. Hotels with restrooms and showers are located close to the beach. The tour includes transportation to and from the port in Fort Lauderdale from your Miami Beach hotel or the central meeting point. Your driver will pick you up from your Miami Beach hotel or central meeting point and will take you to Port Everglades where, upon clearing security, you board the ferry bound for Grand Bahama/ Freeport. During the ferry ride, enjoy amenities including a full bar, a snack bar, a duty-free shop, restrooms and enough seating for ca. 240 passengers. Be sure to bring your passport! When you arrive at the island, make your way to the beach or chose the optional visit of Pig Beach. 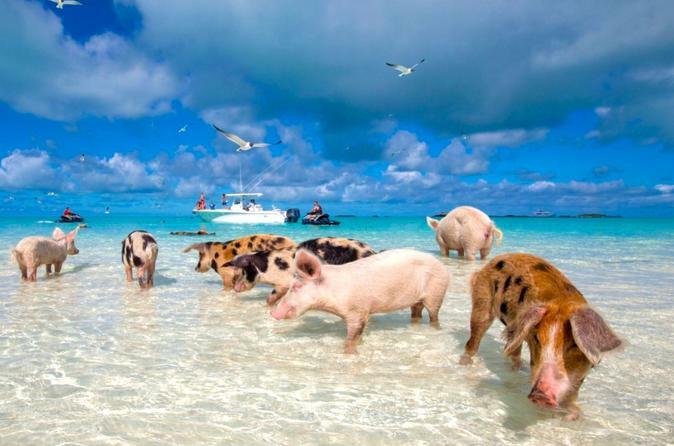 Swim and feed the world famous friendly pigs (surcharge of $ 65 payable on the ferry and minimum of 15 participants applies ) You can book a beach-shuttle or watersports activities on board the ferry, or take a taxi from the port. Once you arrive at the beach, you can find shops that rent equipment for a variety of water sports such as parasailing and snorkeling. If you want to just chill out, claim a spot on the sand and soak up the sun and sea! Grand Bahama is known for casinos and the straw market, where you can buy duty-free local rum, handcrafted souvenirs and gifts. When you want to grab a bite to eat, head to a cafe or restaurant (own expense). Soak up the tropical beauty of Grand Bahama Island before departing on the return ferry in the afternoon.